A few months ago, a friend came to me with a beauty product question.She asked me if I knew where she could get Its a 10 hair products in Toronto. I had never tried Its a 10 and was not even aware it was available in Canada. I had seen it in the videos of some of my favourite YouTube gurus but never on the shelves of local stores. I did a bit of research and found out that First Choice Haircutters had previously stocked the It’s a 10 products. I phoned them and was told that they were having difficulty importing it so they stopped carrying it. I continued to ask around about the product and people had wonderful things to say about it. The more I asked, the more interested I got. On a Buffalo shopping trip, I spotted the Its a 10 line of products. I had a bit of sticker shock when I saw the price, $35.99 for a 10oz bottle of the Miracle Leave In Product. So , I passed. I continued to read about It’s a 10 and watch YouTube reviews. It appeared at Trade Secrets , in Canada for $49.99. Looks like the Buffalo deal was pretty great after all. So , the next time I went , I picked up a bottle. 1. Repairs dry damaged hair. 3. Smoothes and controls frizz. 4. Seals and protects hair color. 10. Flat iron spray and thermal protector. 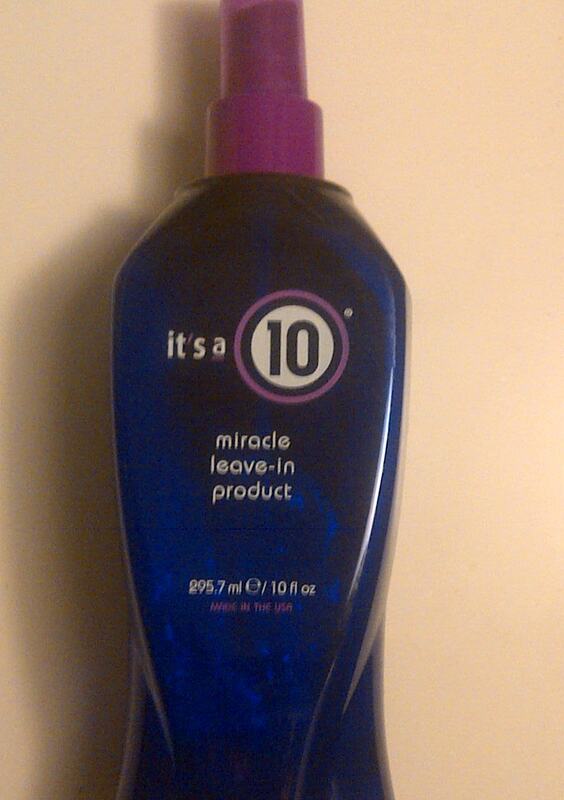 There are a number of products in the Its a 10 line including , shampoos, conditioners and styling products. The Miracle Leave in product is my far the most talked about item in the line and the other products seem to be supplemental. I have fine wavy hair that is prone to frizz and dryness. I have dyed and fried it a fair bit in the past , so the last few years I have really been concentrating on reducing heat styling and conditioning. The Miracle Leave in Product is a spray, with the actual product appearing thick and white, like conditioner. When I first tried it out, I really liked the way that this product worked with my hair. I spray my hair while damp and then continue to style as usual. I hate when leave-in products make my hair feel dirty and weighed down. When dry , I couldn’t even tell that there was product in my hair except for the fact that I noticed right away that my hair was softer and shinier than before. I appreciate the fact that I don’t have to add the additional step of heat protectant when using this product. I have added it to my routine, spraying it into my hair daily after washing. Even when I let my hair air dry, I find that the It’s a 10 leaves it soft and silky. The last time I went to my hairdresser for a trim, I brought my trusty It’s a 10 bottle to spray after the wash. My hairdresser said that she noticed a difference after blow drying the very first section and would be purchasing the product for herself. That is a winning endorsement. I am happy with my purchase of It’s a 10 and I feel it has definitely helped with the condition and appearance of my hair. The Its a 10 line of products is available at some Trade Secrets and the new Canadian Target stores. Have you ever tried any of the It’s a 10 products? Guess I have to hit up my local tar-jay for this one! Wonder how it’ll work on thick hair.. If you try it , please let us know what you think. Thats the tricky thing with reccomending hair products. They can be so different on each person , depending on their hair type. Sounds good..straightening and blowdrying my hair has made it dull and dry…looking forward to trying this! Heat is the worst for hair but its so hard to stay away from those hot tools! Wow, I want to try this! I hate to say it, but with hair products you get what you pay for a lot of the time – the heftier price tag on this product sounds like it is worth it though! What a cool name too – especially since it is so good! It works really well on my hair. Its pricy but it lasted me about 6 months! SOooo… I fried my hair putting in some highlights. And I was devastated. Until I used It’s a 10 on my freshly washed hair – 2 squirts in my hand massaged through the ends ( I have very long hair ). It was like night and day. I have no clue why it works so well, but when things like this happen, a girl doesn’t ask questions. My only observation that deserves a mention is that a little goes a long way, 100% true story. The moment you put too much, ehhh – you can feel it, which will make you not like the product. I had originally bought this product to use as a heat protector. And I quickly dismissed it because (unbeknownst to me at the time), I used TOO much and didn’t like how it made my hair feel. I purchased it online from folica.com – but when my bottle ran out and I went back to them to stock up I almost cried cause they didn’t ship it to Canada anymore.. Ash saved the day – finding out for me that Trade Secrets carries it. It is WAY over priced there – cause if you live in the US you can order a 10oz bottle for 20 something bucks from Amazon, right now it’s on sale for $14.29 ~ http://www.amazon.com/Its-10-Miracle-Conditioner-10-Ounces/dp/B002PMLEK6 ~ free shipping on orders over $25 which means you could get 2 bottles for less than the price of 1 at Trade Secrets. Just wanted to leave my 2cents and say Thanks to Ash! Thanks for having my back.